Welcome to the studio - we've been waiting for you! ​Whether you are looking to get your first tattoo, you are adding to your tattoo collection or you want to cover up or bring an old tattoo back to life, you have found the right place! We are committed to giving you the tattoo YOU want! 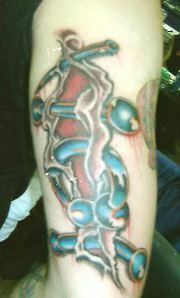 We are the only family owned and operated tattoo studio around. The owner, Matt Littke, has won awards at every tattoo expo he has attended. Matt is and will be the only artist in our studio, he is professional and friendly, he has almost 30 years experience tattooing and is fast and light handed. Matt does everything from the smallest to biggest tattoos, butterflies and lettering to the most intricate celtic knotwork or Polynesian designs. Matt specializes in covering up or fixing up those tattoos you've gotten elsewhere that you aren't happy with. We are proud of his work and it shows when you see EVERY tattoo he does posted in his photo albums. Visit our facebook page and view over 50,000 pictures! Most artists pick and choose what pictures to show you. Matt shows you everything he has done, because he has nothing to hide. Matt's tattoos are done to perfection, there are NEVER misspelled words, flaws or errors in his work. Use the link at the top of the page and like us on facebook. Not only do we run exclusive deals on our facebook page, we also have thousands of tattoo pictures. We've even separated them by category to make it easier for you to find what interests you. Stop by tonight and see Matt, you'll be glad you did! You can also text(810 364-3500) or email us(needlefreaks@hotmail.com) to get a quote on the tattoo you've been dreaming of (make sure to include the size you want it)! While you are here you can visit our arts and crafts area. All the arts and crafts we sell are created by local artists. We also carry our own clothing line, jewelry and other gifts! A FACTORY OR PRODUCTION WORKER WILL WIN $250 IN TATTOO WORK! Do you work in production or in a factory? This year we are giving away $250 in tattoo work to one lucky person that works in production or in a factory. The winner can choose whatever design they want (value up to $250) ! No purchase necessary, anytime you stop by you'll be entered to win! Stop by as many times as you want between now and 10/19/19 when one winner will be randomly drawn. Business Hours: Wednesday & Thursday 10am-6pm and Friday & Saturday 12pm-9pm. Enter as much as you want! Matt has a binder of pre stenciled designs that have been discounted. All pictures are labeled with the original price, and the newly discounted price. They are just outline drawings, but the price includes the shading, colors, etc...the price will cover the finished product. Stop by the studio to see the designs offered or go to our facebook page. Don't miss out - first come first served!! We want to see what you and your tattoos are doing and where you're at! This event is just for fun! Please take a picture of any tattoos Matt has done for you, wherever you may be at! It can be as simple as watching TV or while you are on vacation. We just want to see WHERE YOU AT TAT? Send as many pictures as often as you want. Please, no close ups! We want to see where you're taking your art! All pictures will be posted to this photo album ( https://www.facebook.com/media/set/?set=a.1671140156273131.1073741936.295817223805438&type=1&l=62009a7b36) - copy and paste to view or visit our Facebook page. Please text your pictures to 810-364-3500. Send us an email if you want a quote or if you'd like to receive future emails with promotions, discounts and specials. We accept Cash, Credit/Debit cards, PayPal, Apple Pay and Gift Certificates! We are a kid friendly business! We have toys and a coloring area. No need to pay a babysitter - bring the kids with you and make your tattoo a fun night out for everyone!